Anthony Munoz grew up east of Los Angeles, California, where he excelled at football, basketball, and baseball. At the University of Southern California he earned All-American honors and led the Trojans to the NCAA football National Championship in 1978. He was selected by the Cincinnati Bengals as the third overall pick in the first round of the 1980 NFL draft, and quickly became one of the league’s premier offensive linemen. During his 13-year career, Anthony was selected to play in 11 consecutive Pro Bowls and was named NFL Offensive Lineman of the Year multiple times. Battling through a number of injuries that could have ended his career, he started all but 1 of 186 straight games from 1980 to 1990. In 1991 Munoz was honored as NFL’s Walter Payton Man of the Year, and in 1998 he was enshrined in the NFL Hall of Fame in Canton, Ohio. He and his wife, DeDe, have been married for 38 years. Anthony sat down with me to talk about football, family, and faith. Anthony: I never met my dad. He was in and out of prison. I have two older brothers and two younger sisters. Mom raised the five of us by herself, working two or three jobs. We didn’t have a lot financially, but we had a lot of support and encouragement. Because Mom worked so much, we had to learn how to clean the house, cook, and wash clothes. We never had a car. We rode bicycles a lot. At what point did you realize God had blessed you with unique athletic ability? Anthony: When I was about 7 or 8. Baseball was my first love. I was big for my age and was already very competitive. They couldn’t start the games until the coach showed my birth certificate to prove my age because I was so big. My childhood dream was to be a Major League Baseball player. I played in high school, mostly third base, and I pitched. But at 6-foot 6-inches and 280 pounds by my junior year in high school, it looked like the football uniforms were going to fit a little better! I always wanted to go to USC, and they offered me the opportunity to play both baseball and football. What advice would you give to a young person about athletics? Anthony: If you play, don’t quit any team. Give it everything you have, just like you do in class. Be dedicated. Compete, but have fun. You’ve got to enjoy it. You’re going to learn a lot about yourself and about other people. What life lessons did you learn from playing football? Anthony: It’s not about being a tough guy. It’s about being disciplined physically and mentally. I learned that I could take myself beyond the threshold of where I thought I could go in my weight lifting and conditioning. Every year as I got older, I stepped up the intensity of my preseason conditioning. I learned to be on time. I still do that n ow. I learned that if you need to be somewhere at a certain time, you get up a little earlier so you can be there ahead of time. I learned how to complete tasks and how to work together with my teammates. Black, white, brown—whatever your cultural or socioeconomic background, you could work together for the same goal. I learned the importance of remaining teachable and coachable. During my twelfth and thirteenth year in the NFL, I was still learning. I’ve seen guys get to the point where they say, “Don’t worry about it, Coach, I’ve got it.” The slippery slope starts right away and they start to decline. You have to be able to accept constructive criticism and correct what you are doing wrong. Left tackle is a difficult position on the football field. What are some challenges of playing in the offensive line? Anthony: The amount of knowledge you have to gain. You have to know the playbook, the quarterback’s audibles, the line calls, and the defenses. You have to be able to make quick adjustments depending on what’s going on. You also need the mental capability of forgetting quickly. If you give up a sack, you cannot let that stick with you for more than a play because it will affect the way you play. You need a short memory. You endured a number of injuries throughout your career. What did you learn from dealing with pain and hardship? Anthony: Injury is part of the game. It’s going to happen. Three out of my four years at USC I was under the knife. I’ve had 15 or 16 football-related surgeries. But after missing more than half of my college games because of injuries, I didn’t miss a pro game until week 14 of my eleventh year. There were questions about my durability, so that motivated me. That’s why you have to do your preparation, conditioning, and weight training. You have to learn to overcome adversity. I’ve met a lot of successful people, and I can’t remember one who hasn’t gone through some tough times and obstacles. I learned from my mom and from my mentors to work hard and never give up. You played in some big games, including the 1980 Rose Bowl and two Super Bowls (in 1982 and 1989). What was it like to play under the national spotlight? Anthony: Crowd size, TV—that didn’t bother me. There were 95,000 people at my first college game. I was excited. It was what I wanted to do when I was growing up. I welcomed the opportunities and I wanted the biggest challenge. Your first workout during the off-season, you’re thinking, “I want to be in the playoffs and the Super Bowl.” Only two teams out of the entire league get to be there. When players say, “It’s just a regular game,” don’t believe it. The Super Bowl isn’t a regular game, but once you get into it, you just play. What do you consider the greatest highlight of your athletic career? How do you integrate your Christian faith with athletics? Anthony: My wife DeDe and I got involved in Bible studies during our last couple years of college. After I was drafted and started playing in the NFL, God showed me that worship isn’t just about Sunday morning. Colossians 3:23 says, “Whatever you do, work at it with all your heart, as working for the Lord.” I incorporated my faith into football in my preparation, my intensity, and my performance. I wanted it all to be for his glory. Football is meant to be played physically—to dominate the guy across from you. Since God gave me that gift, it was my goal to make every single play a worship performance. Now that your playing days in the NFL are over, how do you spend your time? Anthony: Football gives me an instant connection with young people. 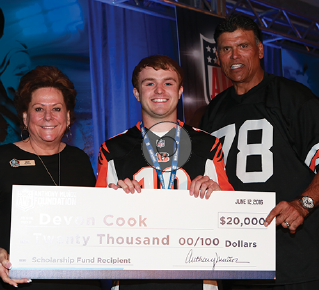 I started the Anthony Munoz Foundation to impact youth mentally, physically, and spiritually. The Foundation gives us a chance to mentor young people, hold character camps, and provide scholarships to help young people go to college the way others helped me.